If you compare the costs (both fixed and running) with conventional housing, you will get a very pleasant surprise. 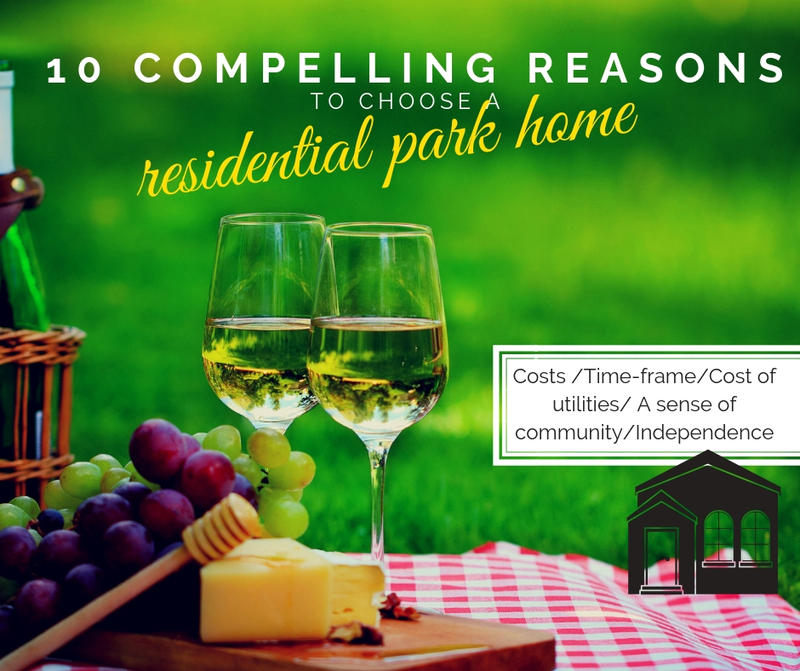 Residential Park homes are much lower in cost and maintenance in terms of utility bills and running costs and offer much more value for your money when you buy. A huge benefit of moving into a park home and downsizing from your ‘brick n mortar’ home would be – an easier/smaller house to maintain, moving into a popular location or maybe nearer to loved ones and also lower energy bills and council bills. You can choose the location in which you would like to live the rest of your life, whether it’s just 1 mile down the road from where you live or whether its Cornwall which you have always loved! The homes are single-story bungalows with generous outdoor space to ensure your passion for gardening. All park homes conform to British Standard 3632 and are protected by a 10-year Gold Shield structural warranty. If you are yearning for some good old British community spirit a Residential park community is one of the best options to consider. The average age of residents in park homes is above 55, in fact in a survey in 2002, 68% of the residential park occupants were 60 or over. There are very good chances that you meet like-minded people in your community who share similar beliefs and interests. There are great opportunities for friendships and many parks have their residents organize social events and community clubs. We are a country with an aging population and for many of us, our wealth is locked up in homes which are too big for us to maintain. What park homes actually enable us to do is to free up our capital, get a luxurious manageable home and at the same time put some cash in our bank accounts. “Almost a dozen years ago, Jim and I, decided to downsize to cash in some equity from our bungalow, but every bungalow we looked at to buy was really expensive and the move just was not making sense. Someone suggested Park Homes to us and it was something we had never really thought about before. We decided to take a look and see what the homes and the parks were like and we were honestly surprised and delighted to find we could afford a brand new home finished to a high standard, fully furnished and at half the cost of standard bricks and mortar home”, As narrated by Sheila L, resident of our Blueleighs park. The parks where these homes are situated boast of beautiful settings, availability of amenities close-by and not to forget the social benefits of living in a community of like-minded people. When these parks are developed, special emphasis is placed on ensuring that stores, medical facilities, transport links, and entertainment options are all within easy reach. The concern of moving into a shoebox home is a valid fear as many houses especially newer builds are getting smaller and smaller. However, park homes are not only spacious internally but being part of a private residential estate ensures well-kept and spacious surroundings. It’s possible to move nearer to the family as you can afford a nice home and not be put off by some enormous price tags. Your family, children, and grand-children can you visit you as often as you like. You can choose from modern, open-plan layouts with modular kitchens and your choice of furnishings. The homes are single-storey bungalows and hence easy to clean and look after. These homes are built for permanent residence; they are modern with central heating, double glazing, and energy efficient boilers and quite easy to maintain and clean. All Park homes are governed and protected by Mobile homes act, built to the “Specification for Residential Park Homes”, the British Standard BS3632. The highlight is the ease of maintaining the home especially cleaning- well we can finish it top to bottom in half an hour! Says, Jane Hucknall, a lovely resident of our Radcliffe Park. Saying goodbye to your house which you’ve lived in for years may not be an easy process, but sometimes new beginnings are the way to go. After all, you have taken care of your responsibilities and now it is time for you to enjoy life. You never know when new opportunities open up? We have had a number of residents who actually went on to become resident park managers and were able to help the park community in various ways. “After about 6 months of moving in, the opportunity came up to become Park Manager. Eric always likes to keep busy and do something interesting and he jumped at the chance! He never expected but in 2017 – Eric won the Park Manager of the Year much to our surprise and joy! I am so proud of him knowing that Wyldecrest has so many parks and the competition was intense” Dorothy Norman, Park Village, Crieff, Scotland. You get a great easy-to-maintain and fully furnished new home while at the same time you are independent. It’s like any other home- you have full independence and you have privacy while at the same you are part of a vibrant, active community. You are welcome to keep pets, have your children, grand-children over, tend to your gardens and essentially live life on your own terms. To find out more about the benefits of park homes and how they may help you plan your retirement in style, please visit https://www.wyldecrestparks.co.uk/ or call us at 033 0133 7300 or text HOME to 82228. Next Married in Saltmarshe Castle, now living in Saltmarshe Castle – 43 years later!